Even though many people don’t think about it, finding quality, eco-friendly pet products is a challenge. Yes, you can get natural treats and toys ,but what about seat covers, cleaning clothes, towels, and beds? With Reya playing outside and us traveling more, we decided it was time to get a nice bath set for Reya that would allow us to bath her quickly without a great deal of effort. As well, I desperately needed a protector for the back of my seats to keep fur from flying everywhere in my car. While looking at a variety of options, we were approached by e-Cloth, who asked to review two items from their amazing pet line. To say the last, we couldn’t wait for everything to arrive! Looking for high quality, chemical free cleaning solutions for your home? If so, we think you will love e-Cloth! Since 1955 they have been Europe’s number 1 chemical free cleaning company and came to the US in 2008, hoping to bring their water only cleaning products to all of our homes. Using their own unique microfiber technology, they have revolutionized the cleaning market to make cleaning even easier. To learn more, make sure to watch the video below about how e-cloths work! Sometimes, it can be hard finding the right tools for bath time. This cleaning kit includes two mitts and a very large, nice microfiber towel. We found that the mitt was great at helping get loose hair off of Reya, and gives her fur a beautiful shine. Since Reya didn’t want to cooperate for the camera, however, I used my mother’s Yorkie for pictures. As you can see, the large kit works great for people who have both small and large dogs. Molly is only 5 lbs and this mitt was great for bath time with her, too. 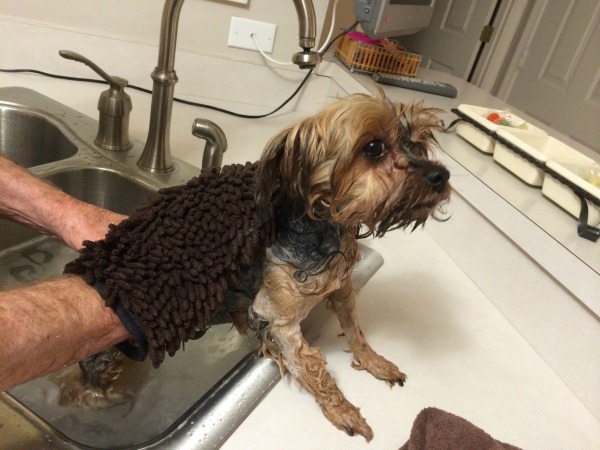 We also find that it worked great with water and a very mild cleaner, for getting rid of matted dirt from playing outdoors. The best part of this kit, however, is the towel! It is great at absorbing excess water and great for some extra cuddle time! Based on our own experience, we are happy to give the E-Cloth Pet Grooming Set in Large an A rating. As someone with a large dog that sheds, I knew I needed something my for my backseat to make cleaning up dog hair easier. I really didn’t realize how bad it was until we had a family member sit in our backseat and they got out with a thick layer of fur all over their clothing! With the Car Interior Protector, you have a waterproof polyester protector to help keep your upholstery and carpet protected from claws, dirt, and even loose hair! Best of all, it fits easily in your backseat or for SUVs, in the very back trunk area. I found that this fit nicely in my older Honda Accord and was very easy to adjust. So far, I couldn’t be happier with this protector and can’t wait to for the next time we go on a big car ride with Reya! Based on our own experience we are happy to give the E-Cloth Car Interior Protector an A rating! 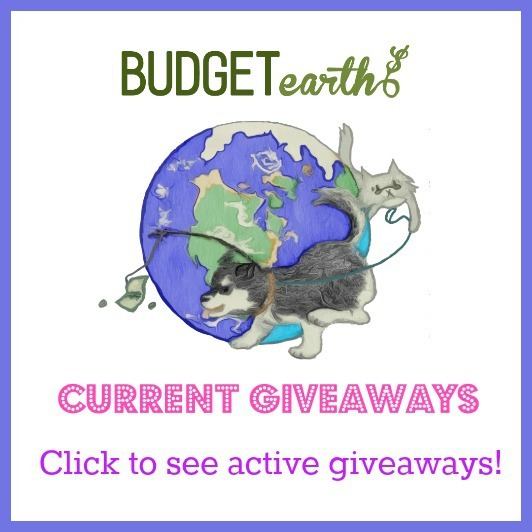 Would you like to purchase these awesome products for your own pets? You can buy these great pet products at the e-Cloth website or look to see if there is a retailer near you selling these products using the e-cloth store locator. this is so cool!! I would love this for my pup! thanks for sharing! What a great giveaway! Between the mitt, cloth & chemical free cleaning products, it would be a delight. To get to try these products! Thanks so much! the video about E Cloth was very interesting. I may have heard of it before, Very much like some of the other products, especially the bathing mitts and towels. I would love to try this cloth on my doxie and rottie mix. It looks really effective. Wow E-cloths are amazing, great video. I learned so much. I can’t believe you can clean without chemicals and just using water, that is fantastic. I am trying to reduce the chemicals that I use. I really need to try one of these. This would be so great for our meow sons who shed so much. Thanks so much for the great info. Oh wow that cloth protector for the car is something we need for Sorcha. Her hair gets everywhere. Thank you for your review. I have five Treeing Walker Coonhounds and three cats, so I’m always either dealing with giving them baths or drying the dogs off when they come in from the rain or snow. These sound really great and would be perfect for my “pack “! That car seat protector is pretty neat! It would sure save us a lot of vacuuming time! And I am sure that our doggies would love a hammock-type seat! I like that they absorb more water than cotton towles and help in excess hair removal, the car thing is just great too. I am convinced that this is a product I need. I am glad you included a link to their website. That way I could subscribe. The link on the giveaway to subscribe took me to Amazon.com. Great idea! This would be perfect for my Mom’s Dog. What a wonderful set to have for your pets! I have a shaggy dog who needs constant upkeep or will end up being very matted. This set would be a Godsend! This is great it would be really helpful we have two girl puppies we adopted i really could use these item thanks for the reviews! I love how the e-cloth protector is waterproof and will protect my backseat against mud and fur. I think my dog would actually like it because she doesn’t like the separation between front and back I think she feels like she is going to fall. These cloths sound really great. I have a cat with fairly long hair and think these would work well with him. I have a bichon frise who requires a lot of grooming. We have been trying to do it ourselves. This would be neat. Thanks for the information on the products. Thanks for sharing.I am going to show my kids.they Have need for them. 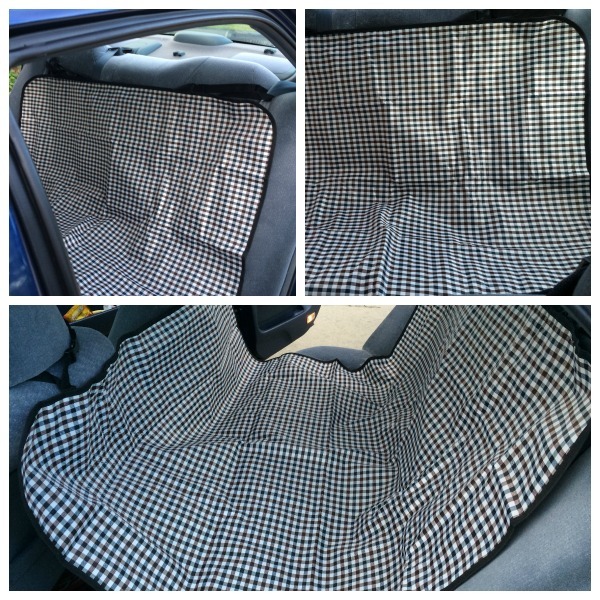 Love the car seat protector and that its waterproof will definitely be a great help. Also like that your products r chemical free. This E-Cloth sounds just like something I need for my SUV! I have a Chesapeake Bay Retriever, which is a large dog, and has a very thick, triple-layer coat. His favorite passion is going for rides with me but I am so embarrassed if I don’t clean up right after and then give a friend a ride and they get out looking like an animal themself! This would make cleanup so much easier! I checked and I have a retailer within 10 miles from me! awww you sweet baby has a look on its face like my baby gets at bathtime! IT is like ohhh if I didnt like you I would so bite you right now! The cloth to put down in the car is great! I love how soft the towel looks too ! You are right it is hard to find eco friendly things for pet care. I like the car interior protector. My dogs always leave hair in the back seat and this is the cutest one I have seen. I have never wanted one before because they just weren’t too appealing but I might get this one. First time I have heard of ecloths and they seem very effective. Want to try them out soon. I have a very sheddy border collie! This product would work great. We have two Golden mixes, so the car liner would be great to have! 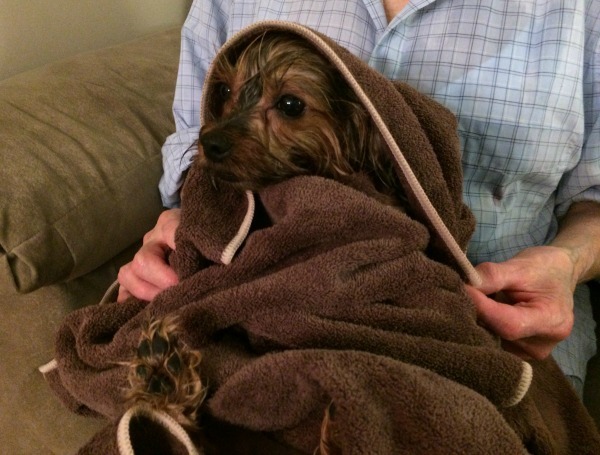 The towel looks perfect for after baths, too! My Alaskan Malamute/Golden Retriever mix loves water and he gets it everywhere. I love that this cloth absorbs water and I can also use it to clean off his muddy feet before he comes in the house. We also go to all the pet events in our area, my suv would be forever grateful if we were to win. Daniel, I would love to see a picture of your dog! I have never seen malamute/golden retriever mix! I use a sponge to get pet hair off of furniture. This product has beeb designed for people with fuzzy kids like me!